Do you remember when you were growing up they had the Food Pyramid that told you how many servings of fruits and vegetables you were supposed to eat every day? Well, the guidelines have changed a little bit over the years but one thing has always stayed the same: Eat LOTS of fruits and veggies! That is not always easy to do when you are a busy mom. I am lucky my kids are not picky eaters because I have seen some kids who won’t eat a vegetable at all! I try and get creative when it comes to my family’s meals so that we are not left eating a straight pile of vegetables every night at dinner. While there is certainly nothing wrong with straight veggies, I find that adding them into breads, soups, casseroles and rice dishes makes it a lot easier to get those 5 servings a day! Well, Del Monte has a huge variety of canned fruits and veggies so you can add a little bit of garden into your diet even during the cold winter months! In a large pot, brown the chicken, onion, and garlic in the olive oil until chicken is no longer pink. Add the 2 cups of chicken stock and season with cumin. Bring to a boil and reduce heat to low. Stir in cream, 1 1/2 cups cheese, corn, and chilies (or jalapenos). Cook, stirring frequently, until the cheese is melted. Enter the Del Monte Add Some Garden Facebook Contest! Enter to Win Del Monte Canned Fruits and Veggies and a $25 Visa Gift Card! Del Monte would like to provide one of my readers with a prize package containing an assortment of their canned fruits and vegetables along with a $25 Visa Gift Card. This is a Rafflecopter giveaway so follow the directions in the form below to enter. Disclaimer: In accordance with the Federal Trade Commission’s 16 CFR, Part 255: “Guides Concerning the Use of Endorsements and Testimonials.”: I received product samples in exchange for my honest review. I received no monetary compensation. All opinions expressed here are mine and mine alone. Regardless, I only recommend products or services I use personally and believe will add value to my readers. The Del Monte product, information, and two gift packs have been provided by Del Monte. The Mediterranean Tuna Pocket Sandwich looks good. The Garlic Beef Stir Fry looks great! The tuna pocket sandwich looks great and easy to make! I like the Chicken and Rice Bake recipe. Garlic Beef Stir Fry looks delish! Thanks!! I'd like to try the America's Garden Soup. 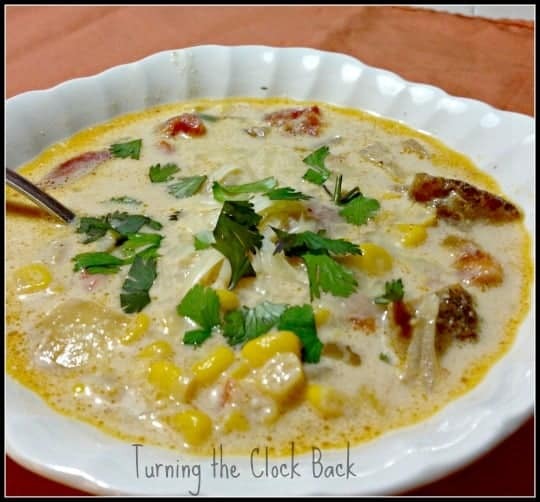 The Fast and Hearty Hamburger Soup looks good-economical, too. I love any recipe with Del Monte, but the 10 Minute Chili is my favorite. The Savory Tomato Angel Hair! pork and pineapple stir fry! Asparagus Antipasto. Never knew what antipasto was (still don't), but the picture looks good and asparagus is pretty good if you can deal with the side effects. The Asparagus Frittata looks really good! Thanks! The PINEAPPLE DREAM PIE sounds dreamy! : ) mmmmmm! The Beef Macaroni and Cheese looks yummy! Garlic Beef Stir Fry - would love to make this! Thank you. The Garlic Beef Stir Fry sounds delicious! The breakfast wraps sound good. The Chicken and Rice Bake sounds delicious! The Garlic Beef Stir Fry looks really good and something I would make. Santa Fe Wraps looks really good...I cannot wait to try some of these recipes out! I think their Cheesy Corn and Chicken Tostada looks delicious! the Mediterranean Tuna Pocket Sandwich looks good to me. :) i love sandwiches! This time of year I'm going for the 10 minute chili! The Orchard Apricot Coffee Cake sounds great! Southwest cornbread stuffing sounds good! Mediterranean Tuna Pocket Sandwich jumped off the page at me.